Let me help you send the 3-message Abandoned Cart Messenger Campaign with best practices and great examples. 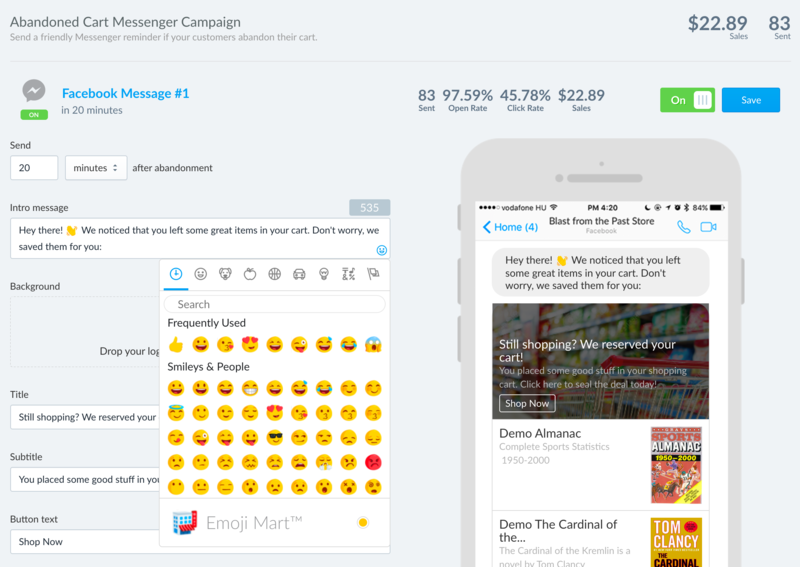 First of all: What's the Abandoned Cart Messenger Campaign? Will you send the campaign to all cart abandoners? 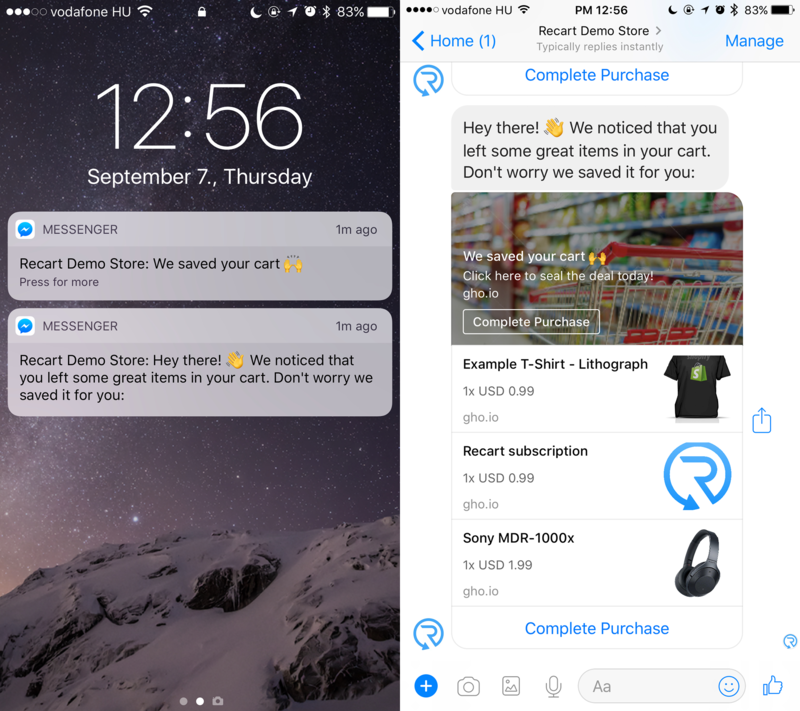 You'll send the Abandoned Cart Messenger Campaign to those, who already subscribed to your Messenger list. Using our popup, you'll subscribe most of the visitors who add anything to cart. Sounds great, right? Can you change the text & schedule? Absolutely! Recart provides a world-class Messenger editor with a variety of customization options. 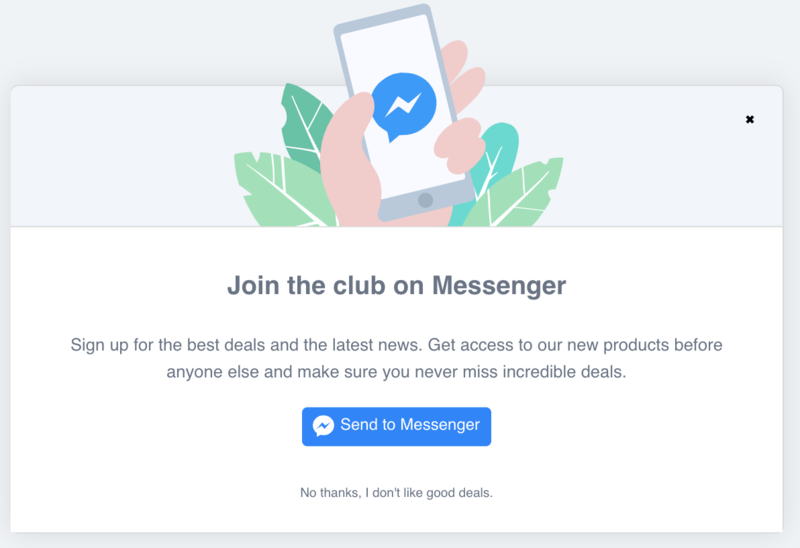 Go to Messenger - Auto Campaigns - Abandoned Cart Messenger Campaign and click on Edit to change a message. coupon codes. You can also change when you want to send the reminders. By default, they're set to 1 hour, 23 hours and 48 hours after cart abandonment. 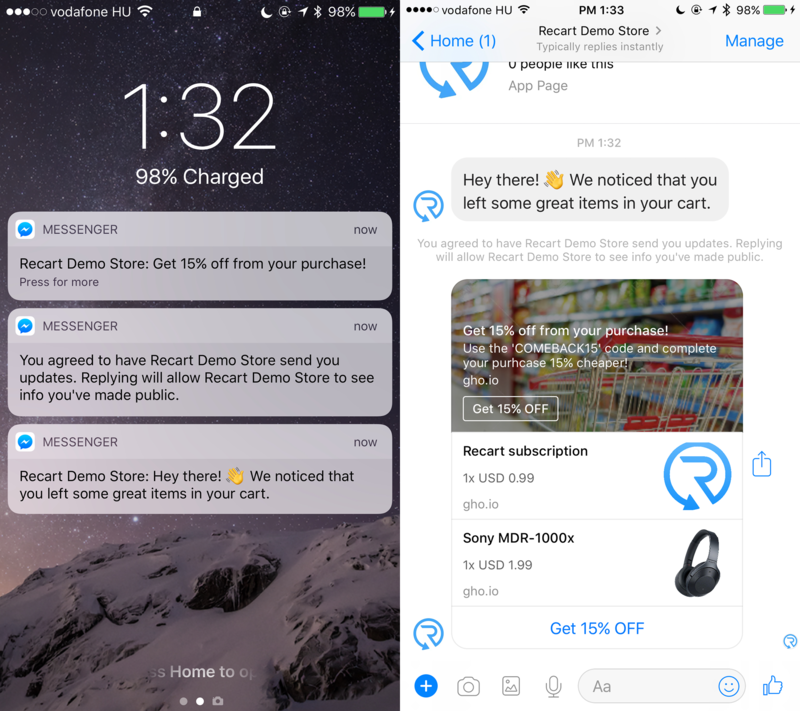 Should you include a discount in the Abandoned Cart Messenger Campaign? Yes! The best way to boost your recovered sales is to add an incentive like a 15% discount to your abandoned cart messages. We recommend you to add the discount to the 2nd and 3rd abandoned cart message. If you offer a discount in the first message as well, please make sure you set your message to 4 or more hours. There are abandoners who just wander off, leaving the office for a lunch, but planning to complete the purchase very soon. You probably don't want to send a discount to these customers and cause confusion. That's why I recommend setting your message to 4+ hours if you give away discounts. Does this campaign comply with Facebook rules? Completely! Facebook allows you to send promotional messages in the first 24 hours of the customers' subscription. It also allows one follow-up message after the 24-hour period, that's your third message. What are the average results of an Abandoned Cart Messenger Campaign? This campaign usually runs with 85%+ open and 25%+ click rate. In average, it makes $0.6 per sent message. It's Messenger, not email. Never include a novel in your messages. Keep it plain and simple. Just like you message a friend. People love emojis and Recart's Messenger editor has an emoji support, so go ahead add some in your messages. After sending millions of abandoned cart messages, I can tell you that giving cart abandoners a 15% discount makes a serious difference, sometimes 2X in recovered sales. Don't forget: when you offer a discount, set your message to 4+ hours after cart abandonment. Feel free to contact us and we're happy to help you!